Years ago, if you wanted to smoke hookah while traveling, you may have had to install a custom hookah rig into the dashboard of your car. Luckily those days of old have given way the to future of mobile hookah smoking. The lid includes a heat diffusing screen over the top which traps in a lot of heat for thick clouds of smoke, while diffusing heat away from the metal to decrease the chance of an accidental burn. Screw the Leila lid on and off to get access to the clay bowl inside. 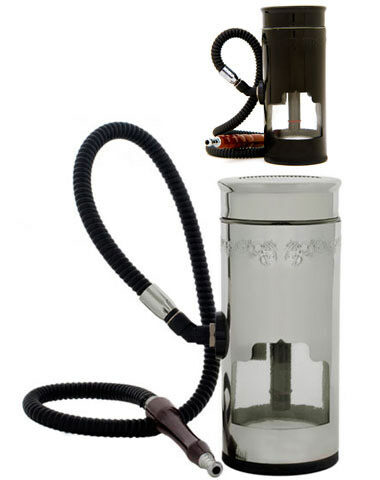 Very little water is needed to fill this compact travel hookah, and the downstem has a red line, indicating the ideal water level. The Leila hose has a waterproof seal that attaches directly to the hose port. No hose grommets needed. Smoking hookah on your road trip made the Leial great, but the fact that you can carry this portable hookah in your hand while you walk down Bourbon street at the next Mardi Gras, or pull it out to enjoy a quick hookah session at the base of Mt. Rushmore makes the Leila reign supreme as the best portable hookah, hands down! Electronic hookahs, a.k.a. E-Hookahs, hookah sticks, or hookah pens, have come on to the shisha scene in a big way in the last recent months. There is a wide range of products to choose from and as any new frontier opens up, you get the law of the Wild West. Anything goes! So Hookah Company wants to make sure you know exactly what you are getting, how to use them, and all the finer details that may not be clear on the open market. We tried and tested dozens of electronic hookahs, "pocket vaporizors" and E-cigarette products to find the best of the best in this new sub-genre of hookah. These are the brands we found with the richest E hookah flavor, thickest smoke, and smoothest pulls. Smooth Electronic Hookahs have rich and delicious hookah flavors without the nicotine. This makes their thick flavorful smoke "smooth" and very easy to enjoy. With lots of flavors to choose from, Smooth E-Hookahs are an easy choice for someone trying E hookahs for the first time. Starbuzz has dominated the hookah scene for years. Now they are one of the biggest players in the electronic hookah market. You can choose from the best selling Starbuzz shisha flavors. Are they E-hookahs or electronic cigarettes? Well, perhaps the truth lies somewhere inbetween. Starbuzz Electronic hookahs contain nicotine, so you will feel a tickle on the throat, but for many E-cig smokers, the flavor is far beyond the market standard. Which E Hookahs have you smoked? What are the best flavors? This is a whole new world and we would love to hear from the front lines. If you have tried these portable hookahs or any other, we would love to hear your thought. Share your experience here and help our community find the best portable hookah for any and every scenario.